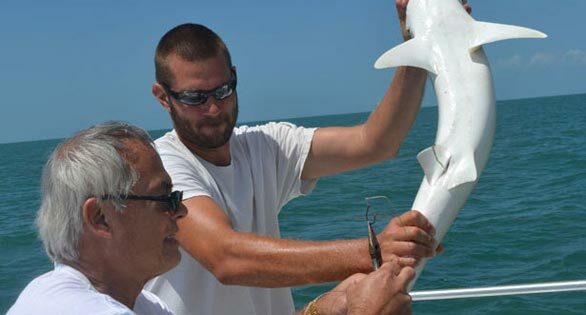 Forrest Young, left, helping land a young Blacknose Shark collected for a public aquarium exhibit. The next time you find yourself eyeball to eyeball with a particularly large and menacing oceanic denizen at a public aquarium, consider this: in all likelihood, that creature has literally passed through the hands of Forrest Young. Over the last three decades, at the helm of Dynasty Marine, Young has established himself and his company as the preeminent purveyor of large and rare saltwater specimens to a very specific and demanding clientele—the curators and staff of public aquariums around the globe, and reef hobbyists with generous budgets for acquiring new species. Young and his crew have made a name for themselves collecting everything from small, ultra-rare deepwater reef fishes to large collections of big predators that require delivery by a chartered Boeing 747. Joboehlkia galdifer, the Bladefin-Basslet, a newly found deepwater species collected by the Dynasty Marine group. Credit: Kiyoshi Endoh. Dynasty Marine’s list of pioneering feats would make it a shoo-in candidate for the Marine Life Collection Hall of Fame: the first successful intentional collection of the Atlantic Devil Ray, Mobula hypostoma, the first directed live catch of the Giant Manta Ray, Manta birostris, and the first air transport of Great Hammerhead, Scalloped Hammerhead, Blacktip, Silky, and Blacknose Sharks. 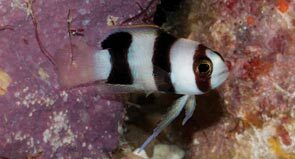 Among smaller fishes coveted by marine aquarium enthusiasts are such “firsts” and new species as the Bicolor Basslet, Lipogramma klayi, the Banded Basslet, Lipogramma evides, the Apricot Bass, Plectranthias garrupelas, the Bladefin Basslet, Jeboehlkia gladifer, the French Butterfly, Prognathodes guyanensis, the Threadnose Bass, Anthias tenuis, Abe’s Angel, Centropyge abei, and many others. At first glance, Dynasty Marine—headquartered in the town of Marathon, 60 miles northeast of Key West—doesn’t look like the epicenter of the public aquarium marine-life trade. Located at the end of a short, tight, industrial cul du sac, it is a conglomeration of open-ended outbuildings, fish tanks, and packing equipment. Stacks of folded cardboard boxes vie for limited space with plastic containers and hard-shelled shipping cases. Off to one side, next to a rack of drying wet suits, sits a single-wide office trailer not unlike those commonly seen on construction sites. But with closer scrutiny this seemingly chaotic environment begins to make sense. Dynasty’s headquarters is not about image. Instead it is a facility dedicated to mobility, innovation, and positive results—a pragmatic response to a progression of biological and logistical challenges embraced by a person who is not used to accepting failure in any form. 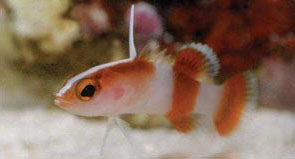 Lipogramma evides, new species first collected by the Dynasty Marine team. Credit: Barry Brown/Curacao Sub Station. Young has a solid reputation as a hands-on manager whose personal touch and guarantee are on every shipment leaving the Dynasty facility, so it wasn’t surprising that during much of our interview he remained fully engaged in the daily operation of his company—piloting a collection boat, baiting hooks, and bagging and boxing fish for shipment. CORAL: Collecting large and sometimes dangerous marine species for public aquariums seems like a very tough way to make a living. What motivates you to pursue this line of work? Forrest Young: I’ve always had a passion for diving, the ocean, and being around marine creatures. It is also a way of sharing my good fortune with others. One of my favorite activities is to go to one of the public aquariums we work with and sit by the window and watch the kids. It is very fulfilling to see the wonder in the visitors’ eyes, hear their comments, and think about how directly we have enriched these people’s lives by the work that we do. CORAL: Was there a particular moment in your life when you decided that was what you wanted to do? FY: When I was very young my parents took me to Marineland and the Miami Sea Aquarium, and it made a very powerful impression on me as a child. Later my folks took us on a trip to the Keys, and I fell in love with diving and the ocean. From then on I was just looking for a way I could make a living in the ocean and enjoy what I was doing. CORAL: How old were you when your parents took you to Marineland? FY: Three or four years old. CORAL: Most kids don’t remember too much when they are that age. FY: I remember the shark channel specifically. Even now I have a clear memory of those sharks thrashing around. They used to suspend a jack from the walkway that went across that round shark channel. It was loaded up with carnivorous sharks. Watching those sharks grab ahold of that fish and chew pieces off—I still remember thinking that was absolutely the coolest thing. CORAL: When did you sell your first specimen to a public aquarium? FY: In 1979, when The National Aquarium in Baltimore opened up, one of the curators called me and said, “We are looking for this species and we are not able to do it on our own. Is it something you think you can do?” I said “Sure,” and sent them a collection of a relatively sensitive species called the Smallmouth Grunt (Haemulon chrysargyreum). That was the start of my working relationship with them. You do a good job for one facility and word spreads. Pretty soon you have two clients, then four, six, twelve—at this point we are dealing with everyone in the world. We ship to every continent but Antarctica. At least 50 percent of our clients are outside of the U.S., and that percentage is growing. 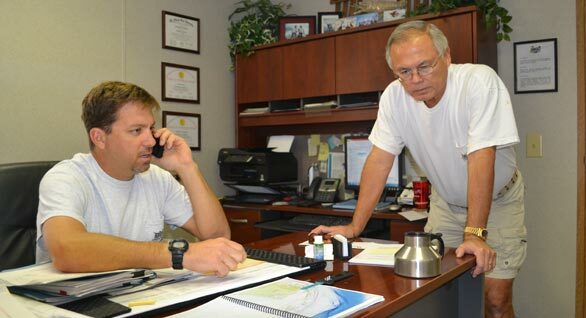 With Ben Daughtry, VP Operations, Young works out logistics of a shipment at Dynasty Marine’s headquarters in Marathon, Florida. CORAL: As the owner of a successful company that specializes in providing public aquariums with marine specimens that are difficult to collect and transport, what do you see as your company’s most valuable asset? FY: Our experience level and our commitment to ethical comportment. What I stress strongly with the staff is that when we take an animal out of the wild, it is our responsibility to care for that animal in such a way that it does as well as it would in the wild—or better. No excuses. CORAL: What does that entail? FY: That specimen is going to be handled properly from the time it comes out of the water until the time it is delivered to the aquarium. It is going to be fed and housed in an appropriate containment facility. It is going to be treated for parasites, and then it is going to be packaged in a manner consistent with the International Air Transport Association’s prescribed method for handling animals in shipment. When we are shipping specimens, the president of the company and the vice president of the company are the last guys on the packing line. My name is on that box and my reputation is inside that box, so I damn well want to know how that animal is. The typical response I get from my clients is “Hey, you guys did a great job, everything came in alive and they fed the same day.” If I don’t hear something like that I am disturbed. CORAL: Dynasty has a reputation for being the first to successfully deliver species that were previously considered impossible to collect and ship alive. Can you give an example of this? FY: We were the first to develop a technique for shipping adult Hammerhead Sharks. All the curators in the industry said it was impossible. CORAL: What was the problem? FY: People who had tried it before didn’t understand that the animal has to swim. It has to be physiologically active to move and ventilate its gills with oxygenated water. Muscular contractions during swimming also help keep bodily fluids circulating. We used a round tank so the animal could swim, and that way it could survive the trip. CORAL: Speaking of survival, you have been outspoken in your condemnation of the local authorities, who are allowing the discharge of effluent into the waters around the Keys and in other areas in South Florida. FY: All of us who have a long history here are more concerned about water quality than any other issue. We are talking about the drainage of fresh water from the Everglades, the restriction of fresh water flow into the Florida Bay. This ultimately creates a hot, hypersaline environment in the Florida Bay. Along with harming the benthic communities in the bay, this hot and hypersaline water (over 40 parts per thousand) flows over our reefs and causes significant coral bleaching events, greatly harming what little is left of our living coral reefs. Another great concern is the fact that now, in 2012, we still do not have completely operational, centralized sewage treatment throughout the Florida Keys. The treatment that we do have still dumps water laden with nutrients and the byproducts of all the medicines that we excrete into the waste water, which ends up getting back into shallow ground wells and ultimately seeps right back to the sea. Water quality has declined considerably over the last quarter of a century. We used to have luxuriant stands of coral out here. There was a stand of Acropora west of the lighthouse that was maybe three-quarters of a mile wide and extended five or six miles. It was 7 to 10 feet (2–3 m) deep, and if a fish swam into it you never saw him again. In the early 1980s it started to decline a little bit at a time; eventually all the stuff was dead and gone, and with it an incredibly complex ecosystem that took the last 4,500 years to develop. It has all been supplanted by an algae-covered rock and gorgonian reef with a few living coral heads and sponges. CORAL: So you attribute this die-off to a decline in water quality? FY: Of course. You don’t have to go very far from here to see the plume of brown effluent flowing out with the tide. We have flushed our toilets out on our reefs for 50 years. If this nutrient loading continues, I really wonder if anything will be left for our kids. We might be the last generation to have seen the real coral beds. CORAL: Is there a solution to this problem? FY: Sure there is: Stop population growth. Stop development. Stop discharging our untreated effluent into the oceans. I am not just talking about local discharges. We have a major discharge of sewage and agricultural wastes coming out of the Mississippi that flows right past here. It has to be a global effort in order for us to turn this around. Right now it is just a dream. 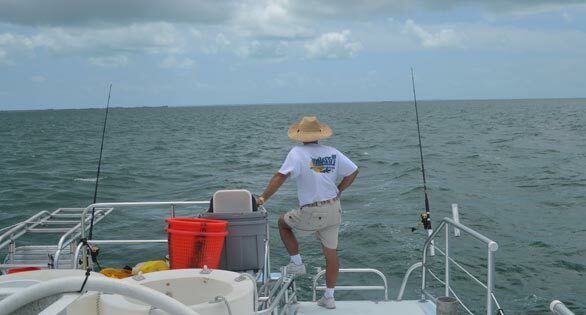 Forrest Young waits for the strike on an overcast day in the Florida Keys. FY: We have taken a number of trips with our Japanese colleagues to Indonesia. The trouble is that where you find the coelacanth in Indonesia is very deep. The shallow ones they have found are somewhat shy of 600 feet (183 m). The decompression on a 600-foot dive would take you 18 hours. That depth is beyond what can safely be done, even with the best rebreather apparatus. There are populations of coelacanth at shallower depths, around 300 feet (91 m), but they are in countries that are either totally opposed to a coelacanth in captivity or politically unstable. From a practical perspective, the capture of a live coelacanth is totally doable, and if things changed tomorrow we would have no trouble getting the job done. CORAL: What about other deepwater species? FY: We have two areas of expertise: one is deep diving with mixed gas rebreathers. We make regular dives here to depths of about 300 feet, sourcing all the various deepwater species that are found off Florida. Some of them reach the U.S. and European hobbies, but the vast majority go to Japan, where interest is more keen and the hobbyist more willing to support the cost of doing such highly specialized and potentially dangerous work. We also have a long-term partnership with Substation Curaçao and the Curaçao Sea Aquarium. My partner there, Dutch Schrier, has a five-man sub outfitted with a full range of collecting devices, and a growing number of new species from deep water are being collected there. The work of our deep diving team couldn’t be done without my partner, Ben Daughtry, and our head diver, Bucky Wile, is also an essential part of our deepwater operations. He is being joined by my son Frank. Collaborative synergies are an essential and very fulfilling element in all of our operations. CORAL: Thanks for your time and for sharing your enthusiasm for marine life with our readers. A Response To “Crawling to Collapse"